When it comes to your horses, you want to make sure they get all the best. The best food, the best saddles, the best grooming and especially the best lodging. If you’ve been looking for a great way to get your horse shelter from the elements, we’ve got you covered. Today we’re going over horse barn kits, one of the most efficient ways to house your horse on the market. Make sure you treat your equine friends with love! You might be asking why you’d want to go with a prefab horse barn over simply hiring a contractor for the work. Well, as you might know, contractors can tend to make for very expensive work. For a quality barn, you might pay as much as $100,000 or more after materials and labor are all factored in. That’s where horse barn kits come in. Prefab horse barns are perfect for people on smaller budgets who have just one or two horses. You’re just looking for a good, high-quality barn for your horse to stay in, nothing custom or over-the-top. If that describes you, then a prefab barn is exactly what you need. Not only does it keep the cost way down, it also makes it much easier to build in a short time span. Usually you can get a prefab barn together in as little as a few days of work. The thing with prefab barns is that they’re shipped in a mostly-completed state. There are usually only a few parts that you need to snap together in order to have a finished product. This means that you can spend a few days assembling the barn instead of a contractor assembling it in a few months. As such, your horse can be in a comfortable barn in no time! What’s the main difference between a custom barn and a prefab, though? Well, generally speaking, prefabs are only really for people with one or two horses. Custom barns can be much more varied and accommodate more specific needs. Prefabs, in general, are made for more generic use cases. That said, prefab barns are nearly indistinguishable from normal barns when viewed. Most casual onlookers won’t be able to tell the difference. Your horse will be just as comfortable in a prefab barn as in a custom job, and it won’t cause you to break the bank! 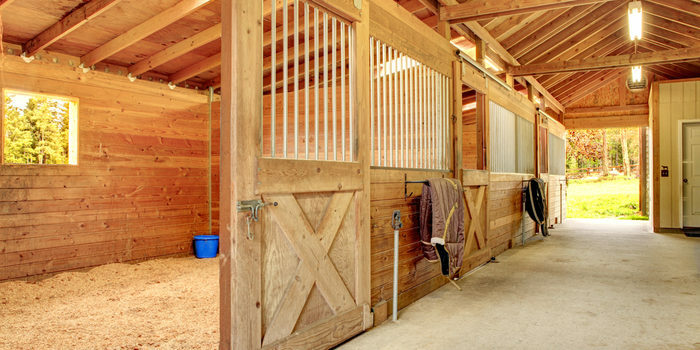 There are three main types of horse barn kits. There are run-in sheds, modular barns and shed row barns. The most affordable and simple of these types are run-in sheds. Run-in sheds are simple barns that are horizontal and comprised of two bays separated by a shoulder-height wall. These make a great storage space for tack, hay and other horse-related sundries you may have. Modular barns, by contrast, are more traditional-looking, with large doors and a more barn-like appearance. These tend to have loft space for your tack and other tools so that you can keep them high up and away from the horse or horses. These are often the higher end of prefab kits, making them a great pick for enthusiasts with two or so horses. The midway point between those two extremes is the shed row barn. Like run-in sheds, they are horizontal barns with very open designs. Like modular barns, though, they have sliding doors that shut and windows as well. This makes them ideal for people with one horse but a lot of tools they want to keep from the elements. Generally speaking, any of these options tends to be as much as 30 percent cheaper than going with traditional contractors for the work. Prefab horse barn kits don’t lack for options for both stylistic and functional add-ons. You can typically add these types of options piece-by-piece when shopping for a prefab kit. These options can include things like extra storage space for tools, hay and the like, or even stylistic add-ons. Extra stall partitions, window coverings, kickboards and the like can all be added on, too. For those with a love for rustic appearances, flower beds and flower boxes can often be added. Skylights, high, decorative windows and even different colors for you barn so it matches the aesthetic of your property. In conclusion, if you’re looking for a great structure to house your equine friends without spending a pretty penny, horse barn kits can be the best option for you. Treat your horses with love!